Stirling’s Bloody Scotland festival had its second outing this year. 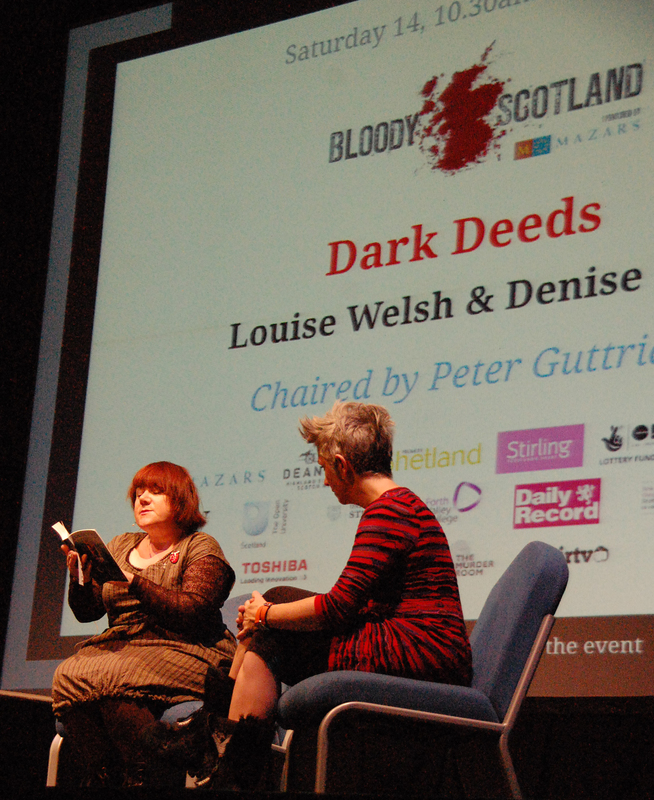 Healthy attendance figures (up 43% on last year’s 4000) indicate that Scotland’s first crime writing festival has the potential to be an annual thing. Events all seemed well attended or sold out. And there was already chatter about next year which is very exciting. I was there with two pals. We drove through early on Saturday morning to see Louise Welsh and Denise Mina at the Albert Halls. They’re two of my favourite writers. Did they talk about Dark Deeds? Well, not really. They did talk very interestingly about the politics in their writing. Intelligent crime novelists can’t help but be somewhat political. Both writers are excellent talkers, with an enviable variety of things going on in their working lives that I can only think must be part of what keeps their ideas and writing as fresh as they are. 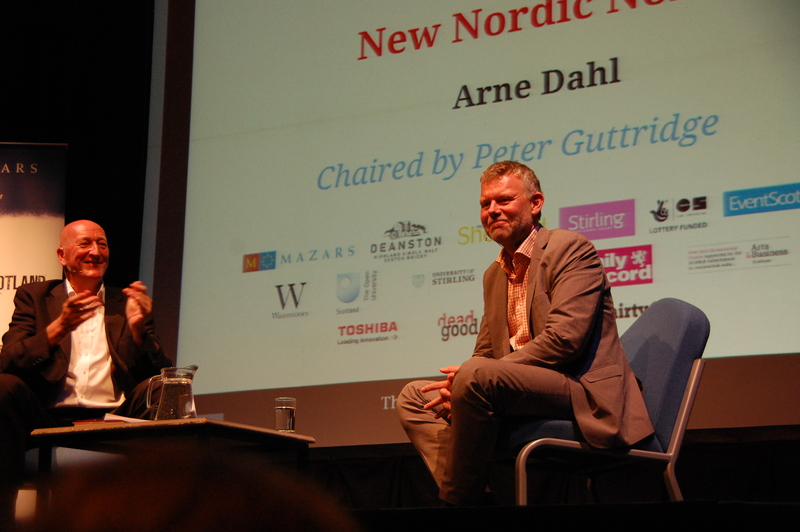 Next up was Arne Dahl (Jan Arnald). A full house. I confess I haven’t read his books and am rather excited that there are eleven of them to look forward to in the Intercrime series. Bloody Scotland had a very Nordic influence this year with appearances by Mons Kallentoft and Jo Nesbo too. They were all very articulate and humorous guests. I am always impressed when people are funny in a second language because of my numerous comic failures in my first language. They touched on the title of the talk: New Nordic Noir. New? He’s been writing crime fiction since 1999, so he’s certainly not new to it. He’s new to me though, but not the audience who were full of questions, deftly handled by Peter Guttridge. Arnald talked of Swedish culture and how Swedes had their idealism about the the safety of their country shattered by the assassination their PM, and about how he bases his books on real crimes. Up at the Highland Hotel, festival director Alex Gray was interviewing Mons Kallentoft. It was very interesting to hear that not all of his work has been translated into English. I think I am right in saying that only the crime novels are so far available, and we’ll have to wait for a marketing executive to think it’s a good idea before the others become available. Back to the Albert Halls, where the biggest laughs of the weekend were from Val McDermid and Stuart MacBride who took gleeful pleasure in running rings round fellow crime writer and chair Craig Robertson, who eventually gave up asking questions and threw his iPad across the room. The topic (The Great, The Good and The Gory) was again – and most spectacularly – redundant. However, I did enjoy the foray into lesbian mud wrestling in Perth (Australia), and Scottish country dancing. Next, a tired looking Jo Nesbo still had a rock-star presence and following, with by far the longest queue of the festival. (I think I got all giddy and carried away, and as a result I forgot to take a picture.) He spoke about his roots (apparently I am the only person in the world that did not know he was a footballer, financial analyst and a pop star). The Deanston Scottish Crime Book of the Year Award Dinner was up next. Malcolm Mackay won the award for How a Gunman says Goodbye. He won a fancy bottle full of whisky. When I next saw his picture in the press, posing with his award, that fancy bottle was empty of whisky. And no, I haven’t read that book yet either. Back into our comfy shoes for a walk through the drunken streets of Stirling to our nice B&B. Sorry about the snoring, girls. Sunday was definitely the rainiest day since records began. I had cleverly forgotten all waterproofs and was usefully wearing highly absorbent linen. Our last event was Mark Billingham and Stuart Neville. Bloody Scotland is a very busy and friendly festival. Because the punters are all crime fans you see the same faces at all the events. I suppose it’s a bit more like Comic-Con than Aye Write in the respect that everyone has one unifying interest (but there were thankfully no funny costumes). It was really slickly organised by Alex Gray and Lin Anderson and their huge team of volunteers, even better than last year. Crime writers seem to be an unpretentious lot and to be quite convivial with each other – and rather too modest about what they do, on the whole. They are used to talking to slightly obsessive fans too. I was very impressed by the quality and volume of the questions from the audiences (very few embarrassing tumbleweed moments, thanks mainly to great chairs like Peter Guttridge). I was slightly surprised that more locals did not know about the festival. An unscientific straw poll of taxi drivers and bar-keepers seemed to reveal this. And, like last year, a few of the bars and cafés seemed unprepared for this ‘unexpected’ business. Be prepared Stirling, this festival is going to keep getting bigger. I really am looking forward to the next one. And I’ve got a whole year to actually read the books.